This weekend was a bit tough for me to study. The fall air poured through our open windows. Every time I opened my book, other things called my name: the farmers market, flea market, the garden, zucchini bread, OU football, wine, lunch, wine, dinner, cleaning the bathroom, going for a 7 mile run, getting my toes painted, more wine, walking my dog, another glass of wine….are you seeing a pattern? Maybe it was the wine that made it difficult? Naaaaaah. While at the farmers market this weekend, we picked up a poop ton of sweet potatoes, zucchini, peaches, and apples! So, when this week’s Food Matters Project recipe was Edamame Cakes with Soy Drizzle I decided to take this asian-inspired recipe to Zucchini Land and use up my new bounty of zucchini! 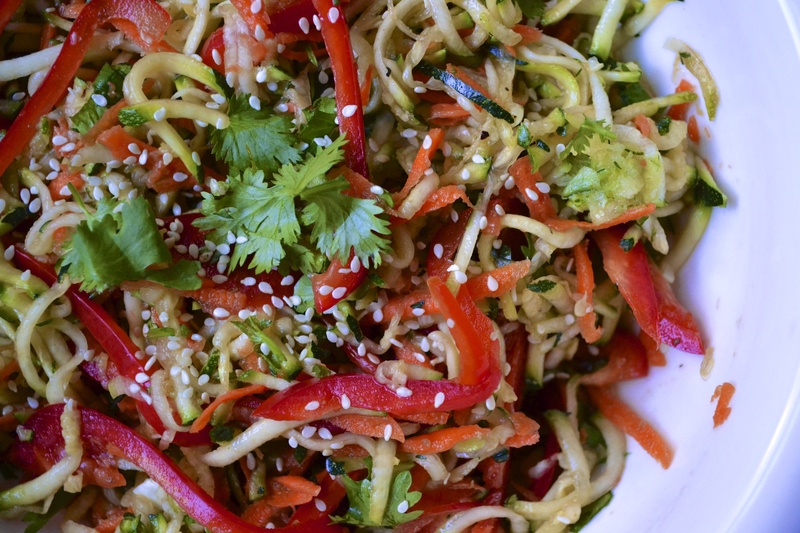 This raw salad is uber easy, so fresh and quite beautiful too. Use the shredder attachment of a food processor to make quick work of shredding up these veggies! Save those knuckles, people! Note: Don’t add the sesame-ginger dressing until you are ready to serve the salad. The zucchini tends to “weep” and get soggy if it sits with the dressing on it for too long. To see the original Food Matters Project recipe for Edamame Cakes with Soy Drizzle, check out Life with the Lushers. And be sure to see what the other bloggers came up with here. If you have a food processor with a shredding attachment, it will make shredding the zucchini and carrot a breeze. Place the shredded zucchini in a colander and allow to drain for about 30 minutes. Slice the red bell pepper really thin. 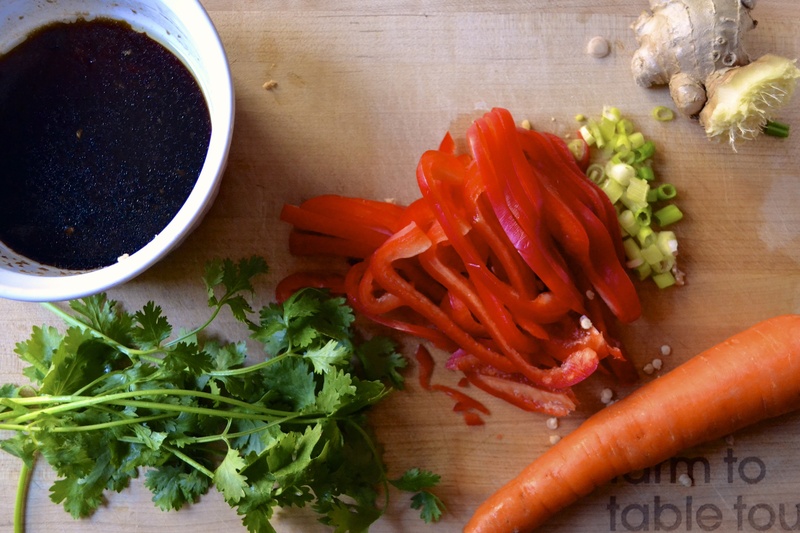 Combine the zucchini, carrot, bell pepper, and cilantro in a medium bowl. Set aside. In a small bowl, mix sesame-ginger sauce ingredients and set aside. 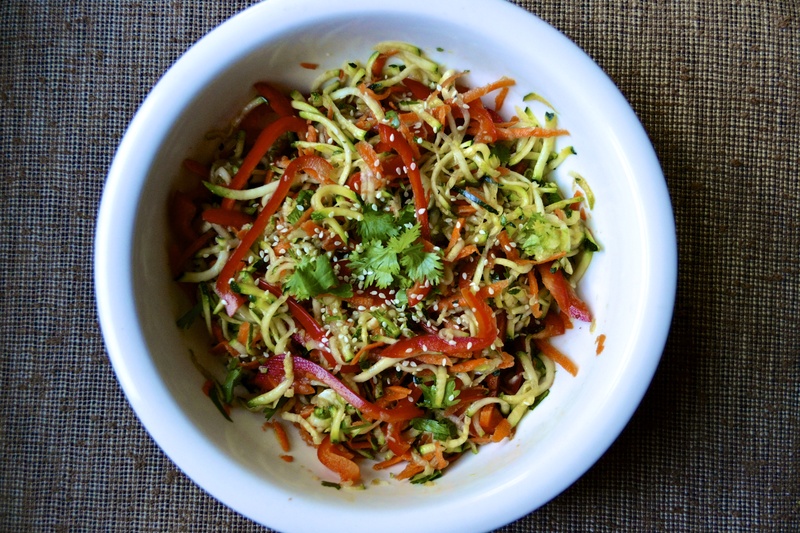 When you are ready to serve the salad, add the sesame-ginger sauce to the zucchini mixture. Season with salt and pepper. Serve immediately sprinkled with sesame seeds. Simple, beautiful, raw! I love it!